One of the more urgent projects on my list was replacing a through hull and seacock. 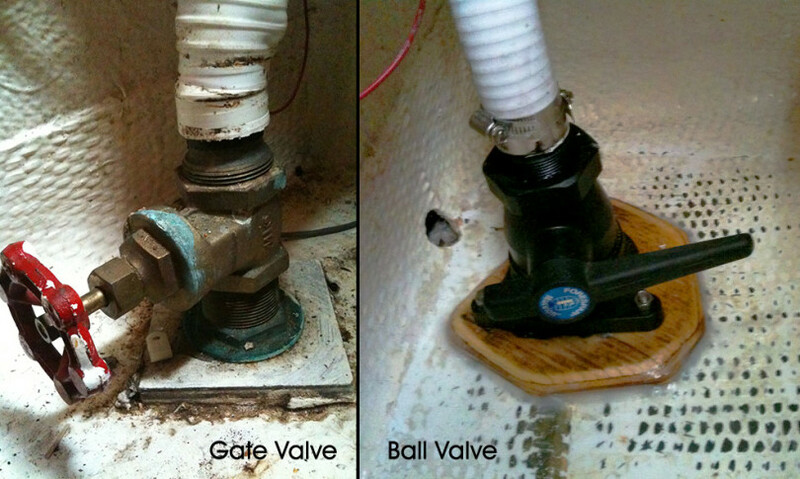 My initial boat purchase survey recommended that should I replace an old gate valve with a more modern ball valve which is not only safer but to the ABYC spec. It was also one of the items that my insurance company asked that I do, so I spent a long time reading articles and talking to my live-aboard neighbors on how to complete this project properly. If you mess this up, the boat will sink! Fortunately, it wasn’t too hard so I’ve documented the steps I went through below so you can get an idea what is involved. I should note that the definitive resource on this subject is on Mainesail’s website and I made sure to follow his advice as best I could. 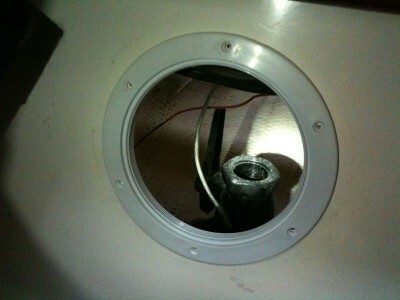 My sink drain runs under the galley counter, through a bulkhead and connects to a through hull located in my settee compartment. Its good practice to close your seacock before leaving the boat unattended for long periods of time because if your hose happens to slip off the drain, you could fill the boat pretty quick. The problem with gate valves is that the way the gate moves across the opening, could get blocked by debris and eventually prevent it from properly closing. The other problem is you can’t really tell if the gate is open or closed just by looking at it. Once I had my boat pulled out of the water, I started removing the old seacock. This was pretty damn hard to do actually. I first removed the 2 stainless steel hose clamps, and wrestled the hose off the top of the barb. I found the hose was full of calcium so I made sure that I would replace this hose as well. 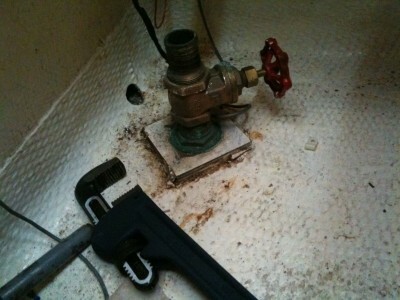 Once the hose was off, I tried to un-thread the valve from the through hull but it was stuck solidly. It was on there so tight, I had spent a good hour trying to turn it even only a quarter turn. This was made even harder because of the difficult access to this location. I had to hang upside down with nothing to lever myself with. After an hour of this I had a good crick in my back and I was getting desperate. I ran out to home depot and bought a good strong pipe wrench and using my feet I kicked at the end of the wrench until it came loose. Okay I have to admit, I was originally intending to keep the through hull that was on the boat and only replace the valve as I had a lot of other projects on my list and was scheduled to be put back in the water pretty soon. But once I had removed the seacock I noticed that I had also ended up spinning the through hull as well. That meant I had broken the original sealant and it would no longer be watertight. Its strange that the sealant is orange. Perhaps it was only a gasket of some sort. Before buying all new bronze through hulls and seacocks, I read about the advantages of using Marelon. Marelon is a reinforced polymer compount, and thus being plastic, it is not susceptible to corrosion. It also happened to be a lot cheaper than bronze so after sleeping on it, I decided to go for it. I purchased it from West Marine and waited for it to arrive. In the mean time I started preparations for a new backing block. As I sat starring at the old backing block and wondering how I would ever manage to separate it from the inside of the hull, I happened to brush my hand across it and it came apart! After 30 years, the original sealant had lost all of its grip and the board relied on the pressure of the through hull to keep it in place. I could have used sicaflex or 3m 5200 sealant but I decided I would follow the advice from Mainesail’s website and attach it to the hull with epoxy resin. This means I have to sand down the paint from the hull and get the surface marked and textured so the epoxy would mechanically bind. 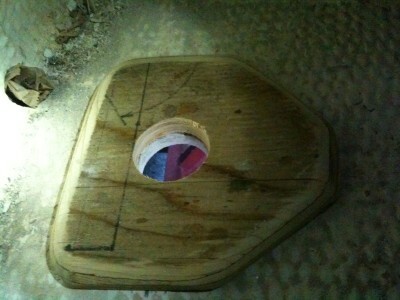 I fashioned a new backing block out of some scrap wood laying around the marina yard. I carefully cut a hole through the center that matched my through hulls diameter, and rounded the edges of the block thinking that I would also lay glass over the block to give it even more strength. I ended up skipping that step thinking that it was plenty strong enough if the previous block had lasted 30 years with a tiny bit of sealant. Surely epoxy resin would be enough. Now I had to decide how the new seacock would attach to my backing block. 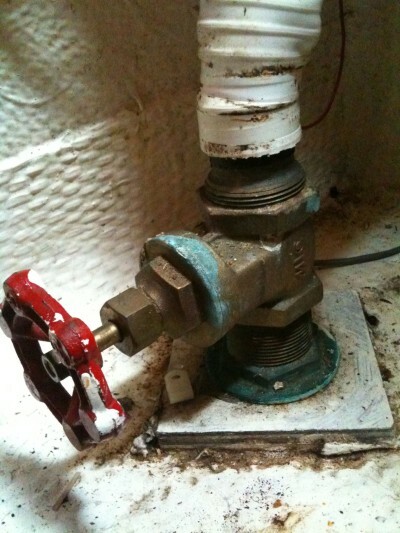 My old gate valve simply sat on the through hull thread. This is actually a bad practice and not a considered a seacock at all. In order to be a seacock it has to be mounted with a flange to the boats hull to prevent it from spinning and to give it a wider surface area to spread any pressure it may get. My new marelon seacock had three screw holes but I didn’t like the idea of having 3 brand new screw holes drilled into the hull of my boat. 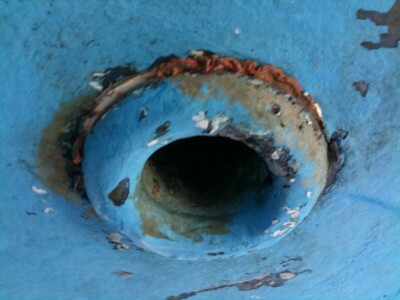 Mainesail’s website had an alternative method of having the screws only penetrate into the backing block but stop short of breaching the hull. Backing block epoxied to the hull and bolts in place. I prepared 3 stainless steel bolts by cutting off their bolt heads. These would be epoxied into the backing block so I simply had to thread a nut down to secure my seacock. I drilled three holes into the backing block in preparation of the bolts, and sprayed Pam cooking oil all over my bolts so the epoxy wouldn’t bind to the bolt. After soaking my backing block with epoxy, I set them into the holes and let them cure for a few days. It was actually cold the next week and it took some time before my epoxy cured properly. Next time I will be sure to have a heater in place in case the temperature dips during the night. 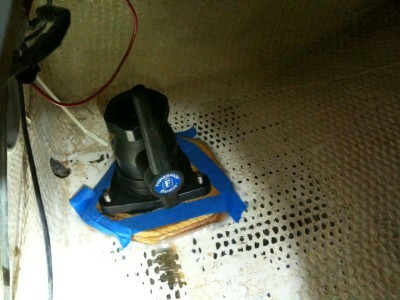 I should mention that you should be sure your backing block sits properly flush. I had spent a long time hand sanding the block so the flange would sit perpendicular to the through hull that protruded from the opening. I also used thickened epoxy to bed the block to the hull so any gaps would be filled. I filleted the edges of the backing block thinking I would later glass it to the hull but that step was unnecessary. Once everything was cured, the only thing left was to re-assemble! I was getting very excited to finally see this project end. It took a surprisingly long time to have everything ready as I was learning as I went along and had lots of little problems to solve along the way. I was sure to test fit at every stage because the last thing I wanted to do was grind out any mistakes and start over. I used sikaflex sealant as using 3M’s 5200 is much too permanent for my liking. I wish I had bought white sealant but it was too late so I went with it. It would be underwater so who cares. I made sure to put plenty of sealant onto the mushroomhead of the marelon through hull and had a friend hold it in place outside the boat while I climbed into the boat to prepare the seacock flange. Before placing the seacock flange onto the backing block I also made sure there was plenty of sealant between it and the block just in case. Make sure you get sealant on the threads where the through hull and seacock connect. Thru hull is in place and seacock flange sealed to the backing block. 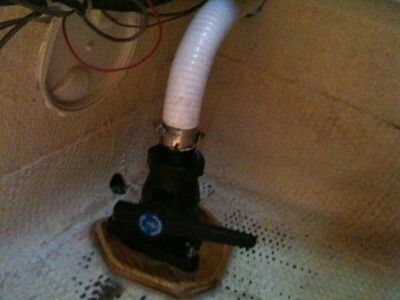 Re-attach brand new hose and used new stainless steel hose clamps.I made sure to use 2 steel clamps as per ABYC spec. You will have issues with your insurance company if your boat does happen to sink and they find the seacock isn’t to spec. One final thing.. I wanted to be able to open and close this seacock often. 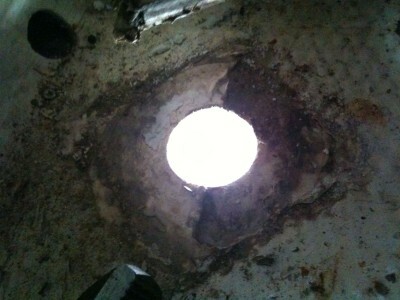 I drilled through the side of the compartment wall and attached a port hole to it. I previously had to move my salon table, lift the bench cushion and fold out the bed. Now I could simply open the port and check on the seacock any time I wished. I was nervous when the boat finally was back in the water but it has been great since day one. The Marelon manufacturer recommends to turn the valve regularly to prevent it from siezing and to even apply lubricant once a year. Final assembly. Note the new access port on the side. I could paint the backing block white so it matches the hull better but I am fine with it the way it is. 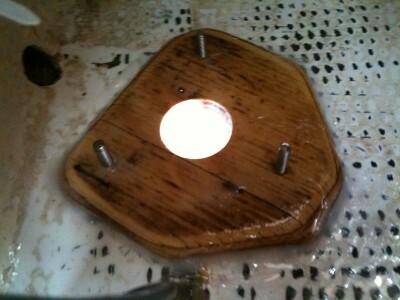 It is not exposed to light so there is no issue with the epoxy degrading over time. Ok now on to my next project.. Replacing the propellor.